Controls 50+ listed brush species, including mesquite, kudzu, blackberry, and multiflora rose. Contains 3 active ingredients for effective broad spectrum control: Triclopyr, 2, 4-D and Dicamba. This product can be used as a spot spray in rangelands, pastures, farmsteads, or as a broadcast spray. (Approximately 3 oz. 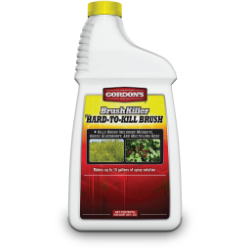 per gallon) Used as directed, this brush killer can control over 40 brush, woody plants and vines. It can also be used as Basal, cut stump, foliage, or dormant stem spray. (Approximately 1 qt. per gallon) Product is labeled to mix with diesel or water.